Liverpool’s lightning quick front three will be absolutely licking their lips at the prospect of facing Bayern Munich in the Champions League if this bizarre stat is anything to go by. According to journalist Ronan Murphy, Bayern are joint-bottom of the Bundesliga in terms of goals conceded on counter-attacks this season. Bayern Munich have now conceded eight goals from counter-attacks this season. That's the joint worst with Nurnberg and Monchengladbach ???? 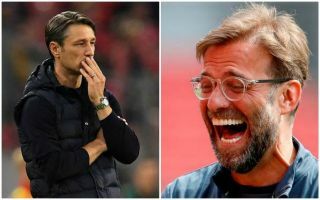 The Bavarian giants have certainly not been at their best under Niko Kovac this season, while Liverpool sit top of the Premier League and made it to last season’s Champions League final. In that run, you may remember the Reds were pretty devastating on the break, with the pace of Mohamed Salah and Sadio Mane in particular causing teams all sorts of problems. If Bayern aren’t too good at defending those kinds of attacks, it could be a goal fest for Jurgen Klopp’s side if they click into gear. Of course, Bayern will have other ways of hurting this LFC side, who haven’t been that convincing in some of their recent games. Still, they always seem to find an extra gear in the big games in Europe, so these numbers look very encouraging if you’re a fan of the Merseyside giants.